Club Day was a great time for you to go around and learn of some ways to do those things. Even if you did not plan on actually signing up for anything, maybe this one club called to you. Wednesday, September 9th was Club Day at our school. 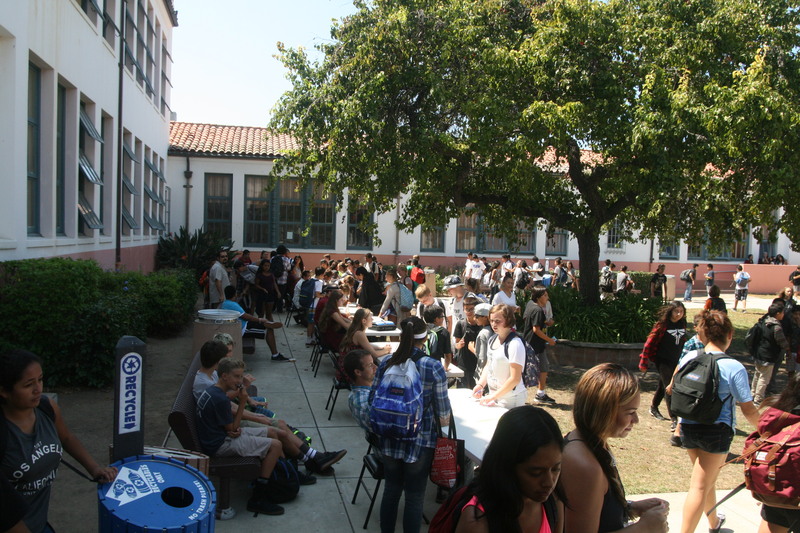 This took place outside in the quad and was a great success! There were many clubs outside trying to recruit new members and many of them were greeted with very rewarded lists by the end. I asked the representatives of each club a few questions about their clubs and here is a quick overview of each club’s focuses and goals. ASB: An acronym for “associated student body,” this is an excellent way to get involved at our school. This club meets every Tuesday at lunch in the advisor of this club (Ms. Sanchez)’s classroom, room 156. ASB’s main focus is planning spirit days, dances, and other fun events in our school and community. Performing Arts Club: A fun, theatrical club led by Mr. Lashua, Performing Arts Club dives into the arts of dance, voice, theatre, and improv. They learn about theatre arts and music by doing many entertaining activities. This club also sometimes watches movies and goes on field trips to see plays. They meet every Friday in room 127, Mr. Lashua’s classroom. Club Live: Another wonderful club that our school offers, Club Live is focused on drug and alcohol-free awareness at our school. They are in charge of a couple awesome events at our school, including Red Ribbon Week. Math Club and Competition Team: If you really like math or are interested in improving your math skills, then this may be the club for you! Math Club and Competition Team is a super fun club that meets at lunch every other Thursday in Mr. Adam’s room 211 where they practice math competition problems and eat some snacks. There is no need to worry about having a nervous breakdown or suddenly fainting because most of their competitions are online and against other schools! Spanish Club: A new club to take place at our school, I am sure Spanish Club will be a blast. This club is not limited to people that take Spanish, anyone can join. As this club is only recently made, the advisor, our school’s Spanish teacher Ms. Mcentee is not yet sure exactly what this club plans on doing, but some of her ideas were that they play fun, educational spanish games, practice some dialogue, and even maybe watch some spanish movies and TV shows. They meet every other Thursday at lunch in her classroom. Bike Repair Club: Do you a bike? An awesome club being introduced to SBJH this year, Bike Repair Club is a free clinic that will teach people how to repair and maintain their bicycles. It will be starting October 1st, and will be meeting every other Thursday from 2:30-3:30. Another great thing about this is that it is a drop-in club, which means you are not required to come every week. If you are interested just show up October 1st with your bike! Woodturning Club: Have you ever wanted to make your own wooden pen? Woodturning Club is a great club that will give you the opportunity to do that and many other projects. Run by Mr. Palmer, this club will meet every week in his classroom. You will explore the art of wood turning and using a lathe, to make pens and other awesome stuff. All of these clubs are going to be amazing and you are encouraged to join any that may call to you. Even if you are not really sure you want to join, maybe just show up to the first meeting and give it a chance! Also, oftentimes other clubs start up later in the year; so keep your eyes open! Note: If you have any questions about any of the above clubs, feel free to talk to the club advisor or simply show up to one of the meetings. Thanks for the great article! I am posting it in my classroom, so students who did not attend club day can see what SBJHS has to offer. We knew you’d come back to Journalism, Coraline…. WELCOME BACK!! !